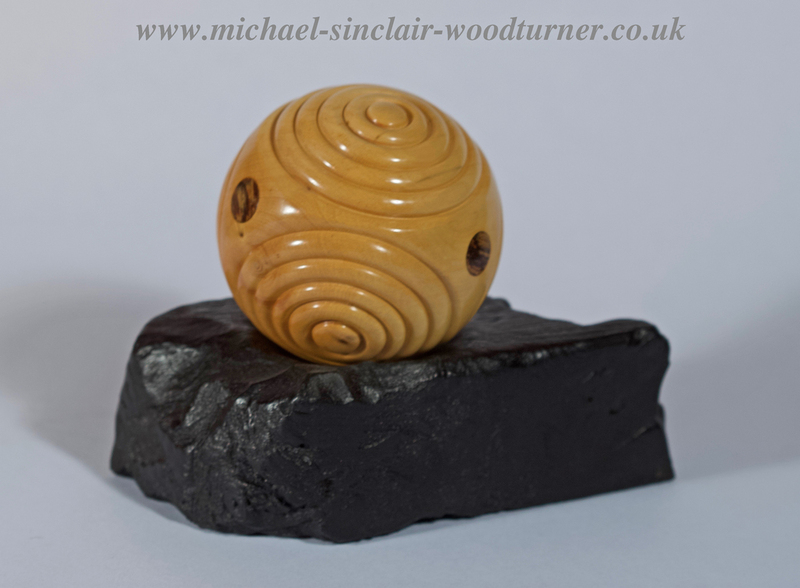 Michael often turns these beautiful, interesting, tactile, fun pieces. For the carved detail the best wood to use is either lignum vitae (sourced from old wooden bowling balls) or English boxwood which we get from a gentleman who sources the boxwood for instrument makers. The wood for theses makers needs to be very uniform in colour and have no knots etc, so we buy what they subsequently reject. This works well for everybody as we love all the little ‘defects’ and therefore there is no wastage . This ‘Petrosphere’ has four facets with inlay of cocobolo between and is displayed on an ebonised base. Michael has turned “Petrospheres’ with 4, 6, 12 and even 32 facets and with different numbers of rings in each facet. He has used different inlay, or turned detail between. All are approx 64mm diameter, like the original stone ones that have been found on Neolithic sites and are a perfect fit in the hand. These are extremely tactile, interesting and a great talking point in any home or on your office desk. Please subscribe to our YouTube channel if you are interested in our ‘goings-on’. Hopefully there will be some nice garden/Orkney videos over the summer as well as more turning.